The rainfall of July 19th and 20th 1996 is typical to a "piedmont" flood, in other words, a quantity of water falling into a trench rather than onto a floodplain. The trench is the Kenogami reservoir. The centre of the precipitation is in the middle of a watershed of small dimension with a hilly relief, which is favourable to the funnel effect because the waters rapidly rush downstream, the Kenogami reservoir. This reservoir wasn't able to hold this gigantic water swell. Moreover, like the ground, it was saturated with water when the flood hit. Each inch of water falling (twelve in all) directly streamed in the Kenogami reservoir and raised its level of an average of five feet. 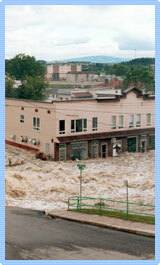 The Saguenay floods of July 1996 are the results of natural factors such as the meteorological conditions, the type of soil, the relief and hydrography as well as the occupation of the territory by human activities. July 18th, 1996, a huge cyclonic depression started building up over the middle of the North-American continent. In July 1996, this gigantic tropical storm covered the most part of the Eastern North America. Fired up by favourable conditions, this humongous cloud system stagnated over the Laurentian wildlife reserve. 2 400 kilometres from East to West. 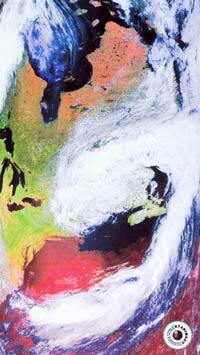 On July 19th and 20th 1996, a bank of clouds stopped over the Saguenay-Lac-Saint-Jean region. This meteorological event left between 170 and 200 millimetres of water in 36 hours and 250 millimetres in 48 hours, the equivalent of the territory's monthly rainfall. If this precipitation had fallen in the winter, the Saguenay-Lac-Saint-Jean region would have received three metres of snow. The Saguenay-Lac-Saint-Jean region sitting on the Canadian Shield has a ground that is mainly composed of granite. This rock isn't very porous and rainwater can hardly infiltrate the ground except into cracks. Moreover, when the torrential rain fell on the Saguenay region, the ground was already soaked up with water. As a matter of fact, between the 1st and the 17th of July 1996, this territory received 120,5 millimetres of water, the equivalent of July's average monthly rainfall. The Saguenay-Lac-Saint-Jean forest is mainly made up of conifers. It is the Boreal Forest. An average of 17% of the rainfall is intercepted its trees. The rest streams down onto the surface of the ground (11%) or seeps into the soil (72%) down to the granite surface. The forest's vegetation thus returns 62% of the rainfall to the atmosphere. The last 38% progressively flow toward the Saguenay river, which represents a most impressive volume of water. On the 19th and 20th of July, the ground was already saturated. The rainwater added on during these two days simply slid onto the surface of ground. 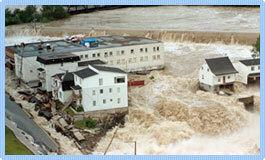 This is one of the factors that caused the flash floods on many waterways. The uneven topography of the Laurentian mountain range helped the torrential rain. The reason is that the relief of the Laurentian wildlife reserve pushes the clouds to the top of the mountains. The effect is a higher condensation in the colder air resulting in precipitation. The phenomenon, called "orography", brought on more rain upstream than downstream, resulting in all the water streaming into the watersheds, to the North. The precipitation data for July 1996 clearly shows the effects of the Laurentian relief on the rainfall. The Rivière-Aux-Écorces meteorological station, located at 1 000 metres in altitude atop the mountain range, recorded 262 millimetres of rain in the span of 50 hours. The Bagotville meteorological station, situated at an altitude of 200 metres down from the summits, received 170 millimetres of rain during the same period. The relief effect also called "orography" resulted in a difference of 92 millimetres of water between the two locations. The Laurentian mountain range is one of the rainiest areas in Quebec; it is also susceptible to the occurrence of the heaviest precipitation in a short lap of time. The way in which the human being occupies the territory in Saguenay-Lac-Saint-Jean has a direct link with the consequences on the floods of July 1996. In the history of the Saguenay-Lac-Saint-Jean, human populations established themselves on the riverbanks, main highways of the time. The natural spring and fall floods were part of life. Later on, dykes and dams were built on certain lakes and rivers, thus creating lakes like the Kenogami and the Ha! Ha! barrier lakes. In spite of these structures, the already established human populations stayed put, thinking they were well protected. So the riverbanks continued to be inhabited and some people even pushed the limits in building their houses on terrain liable to flooding, like ancient riverbeds, floodplains and areas vulnerable to landslides. The population of Chicoutimi's basin neighbourhood thought they were very secure, since they had settled at the foot of the dam. But in July 1996, Mother Nature showed them how vulnerable their settlement really was. Harnessing the waterways of the different watersheds to exploit water and wood wasn't enough; urbanisation continued its ramping expansion thus modifying natural riverbeds. For reasons pertaining to development, rivers were filled in, deviated, bypassed, diverted and conduits were inserted. In spite of all of the river's modifications, people stayed in place, even transforming cottages into permanent dwellings. In the summer of 1996, Kenogami's lakeside residents suddenly remembered that this wasn't a natural lake at all, but really a totally man-made reservoir created solely for human activity. And the consequence to all of this: Once more, Mother Nature unleashed its fury, the rivers got their memory back and flowed into their ancient streambeds. In the City of La Baie sector, the Ha! Ha! River considerably swelled up. It went back to its original riverbed.